HUGO BOSS. Image copyright Mark Lloyd/Lloyd Images/HUGO BOSS. 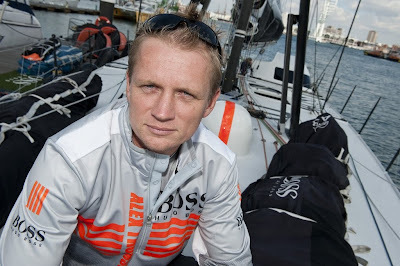 Alex Thompson Racing today announced that Volvo Ocean Race sailor, Andy Meiklejohn, will join Alex Thomson as co-skipper for the 2010 edition of the Barcelona World Race. Alex Thomson and Andy Meiklejohn. Image copyright Mark Lloyd/Lloyd Images/HUGO BOSS. Andy (34), from Auckland, New Zealand has over 100,000 ocean miles to his name, and has sailed extensively offshore, including the round the world 2004 Oryx Quest and the 2005/06 Volvo Ocean Race. Andy Meiklejohn. Image copyright Guy Bell/HUGO BOSS. Alex and Andy have known each other for many years, having first raced together in The Commodores Cup in 2004. Andy joined the Alex Thomson Racing team earlier this year with overall responsibility for the boat performance and he has been a key part of the team that has launched and developed the new HUGO BOSS. Together with Alex he has now covered over 10,000 miles onboard the yacht. Alex Thomson. Image copyright Billy Black. Following his success in the last Barcelona World Race Alex has his eyes set firmly on the top spot and, with his new co-skipper and new boat, he is confident they have the ability and determination to make this happen.